EVGA shows off the GeForce GT 545, a new single-slot card with 144 CUDA cores. It offers a 720MHz GPU, 1440MHz shaders and 1536MB GDDR3 clocked at 1800MHz. Pricing is said to be around $150. 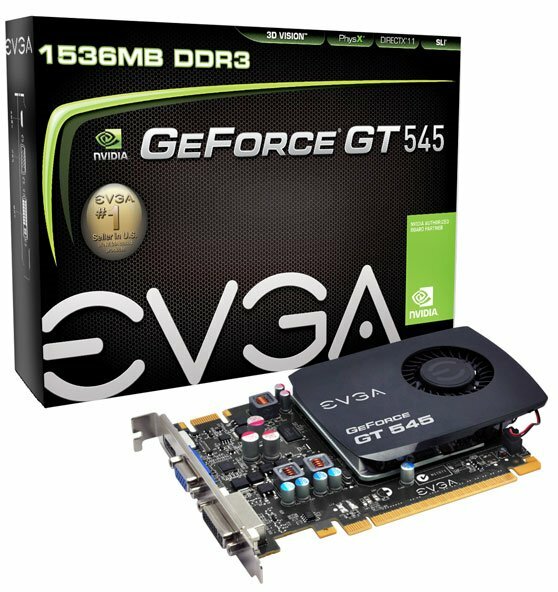 The EVGA GeForce GT 545 has hit retail stores. With this card you can accelerate the editing of your photos and HD videos and experience the most realistic DirectX 11 and NVIDIA PhysX gaming environments. 3D your PC with NVIDIA 3D Vision technology for immersive 1080p Blu-ray 3D, stunning 3D videos and photos, and over 500 intense 3D games, on your 3D Vision PC or 3D TV.